There are plenty of 99-cent smartphone app success stories, but few as big as WhatsApp. First launched in 2009, the cross-platform messaging app has charted a stratospheric rise in popularity. Today, WhatsApp is the single-most-used independent smartphone app in nearly every country in the world. It has hundreds of millions of users, and processes as many as 20 billion messages per day. And, as CEO Jan Koum said onstage at D: Dive Into Mobile on Tuesday, WhatsApp is now bigger than Twitter, which officially claims 200 million monthly active users. The company daily processes eight billion inbound messages and 12 billion outbound. That success has drawn attention from some big Internet companies. In the past six months alone, it has been a rumored acquisition target for Facebook and Google, though it has officially denied talks with both. What’s it like being at the very center of the messaging app market land grab? And how does the company, which forgoes advertising in favor of a 99-cents-per-year subscription fee, propose to convert popularity into significant revenue? Simple, said Koum. Build the platform and the revenue will follow. So why not rely on advertising for revenue in the meantime? 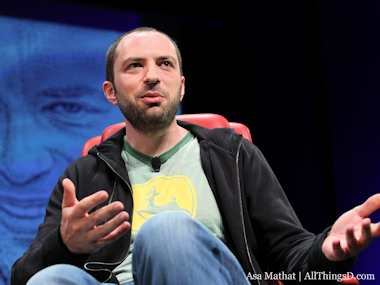 There’s no chance of that happening, said Koum, citing WhatsApp’s anti-advertising philosophy.